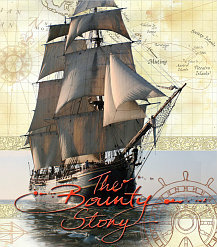 Available from the Pitcairn Islands Philatelic Bureau, a superb gift or keepsake featuring the fascinating Bounty Story together with three recent stamp issues – Bounty I, II and Bounty Definitives. The pack measures 240mm deep x 628mm wide in 3 sections (6 pages in total). With $NZ 47.00 worth of stamps, this pack is very good value at only $NZ 39.00 plus $NZ 5.00 P&P. Click a page to enlarge.